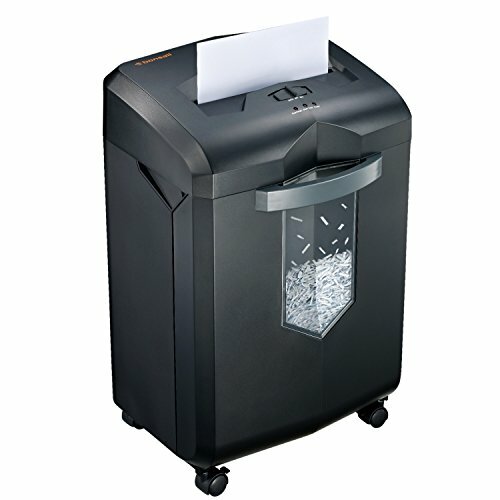 Cross-cut paper shredder with 10-sheet (A4 size 75g/m²)capacity, shredded paper measures 1/5 x 1-50/87 inches(5x40mm); destroys staples/credit cards (one at a time). 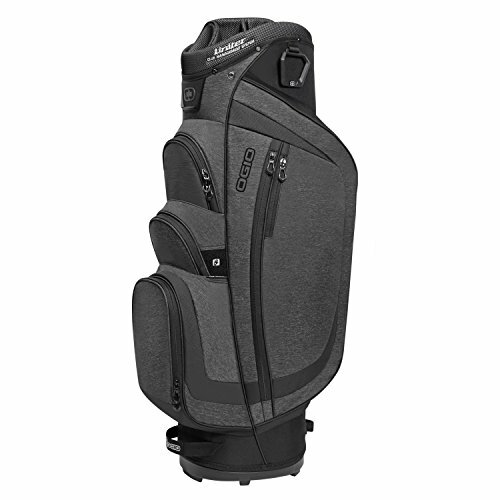 Overheating and overloading protection technology to keep sustainable using the shredder and prolong its lifetime. 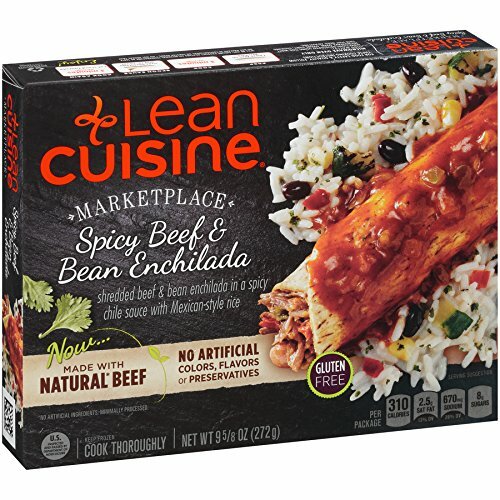 4 minute continuous run time with 40 minute cooldown time. 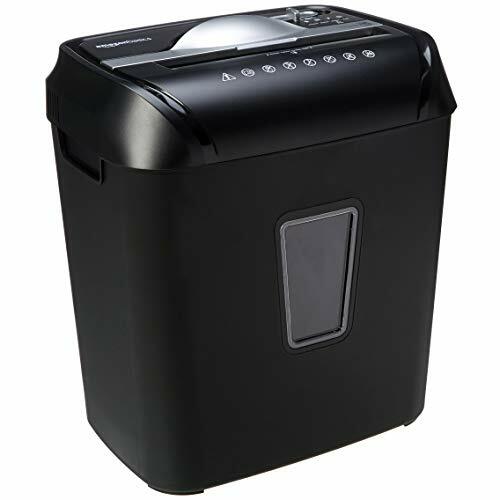 5.5 gallons wastebasket capacity for less frequent emptying; Transparent Basket window to see when it is full, the capacity of 320 shredded sheets. Destroys paper, credit card, clips, staples CD/DVD(one at a time). 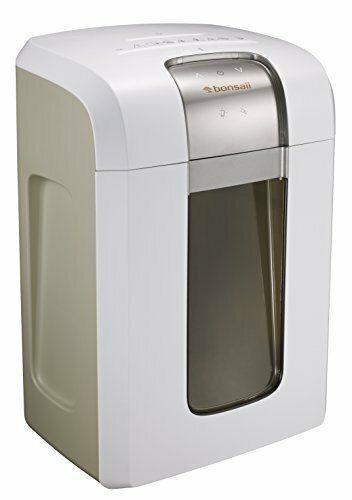 3.5 Gallons pull-out wastebasket capacity for less frequent and easy emptying, Easy to see when it is full with the semi-window. 4 casters for easy to move to any place. &#x1F4C4;【CROSS-CUT SHREDDING METHOD】 With large shredding capacity, this paper shredder can reach 10 sheets at one time and shred your paper in an average size of 0.16'' x 1.6'', which surely provides high security for you with its cross-cut performance. Standard staple and credit card can also be shredded by crossing cutting method. 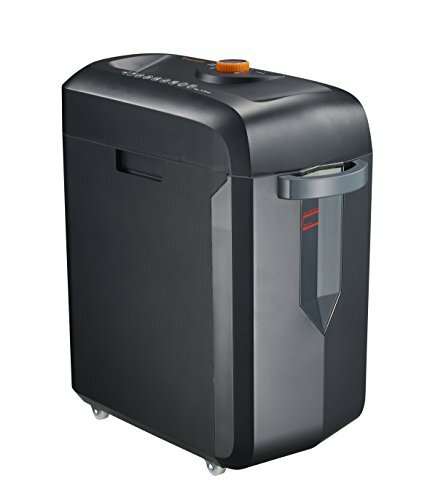 &#x1F4C4;【LOW NOISE PERFORMANCE WITH SAFE USAGE】 This shredder is equipped with overheat protection with LED light on and machine shutting down to cool down in case of overheating, which well prevents accidents to guarantee your safety. Secured interlock switch will turn machine off when shredder top is removed while in use. 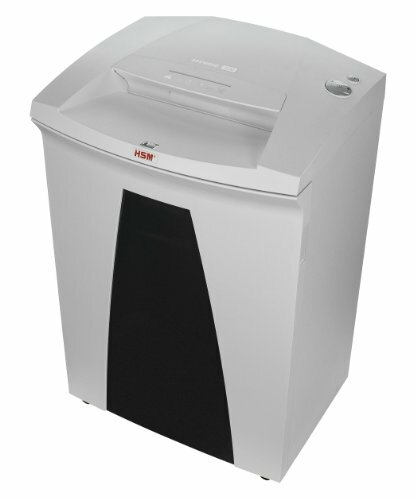 Besides, the noise level of this shredder is lower than 72 db that offers you quiet and comfortable using experience. 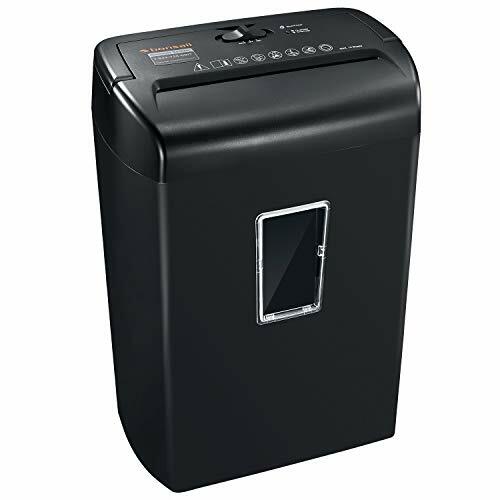 &#x1F4C4;【EAST TO MOVE AND CLEAN】 The top of shredder can be removed when you need to throw the trash away. The inside plastic basket has ample capacity to load paper jams and is also easy for you to clean it all up. 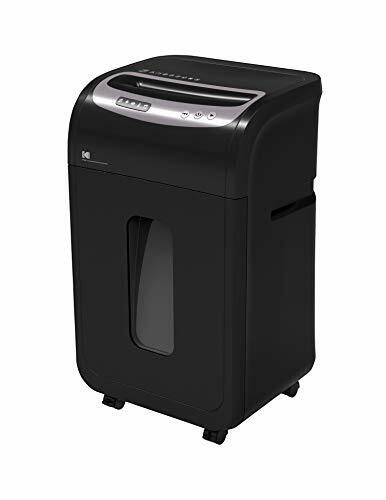 Besides, the whole shredder is lightweight and you can take it to your office or home due to its portable and convenient features. 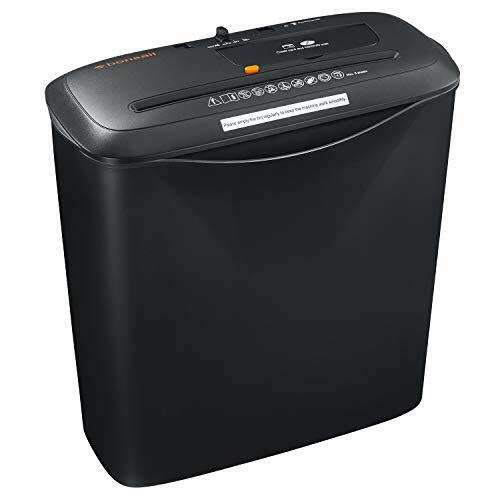 &#x1F4C4;【EASY SHREDDING OPERATION】 You just need to plug the shredder into a grounded electrical outlet and then slide the power switch into auto position and insert paper straight into the feeding opening. It can perfectly keep your private information private. And the panel on the top is quite easy to follow and there is no need for you to read one complicate instruction. &#x1F4C4;【AUTO START AND STOP FUNCTION】 Auto start and stop function is very convenient for you to operate it with one hand. Reverse function greatly helps you clear paper jams. And it is quite suitable both for your home and office use to secure your private documents or other papers as well as credit cards. Protection: Equipped with thermal protection with light indicator to warn you if it is overheated, jam-release switch prevent you from jam frustration. 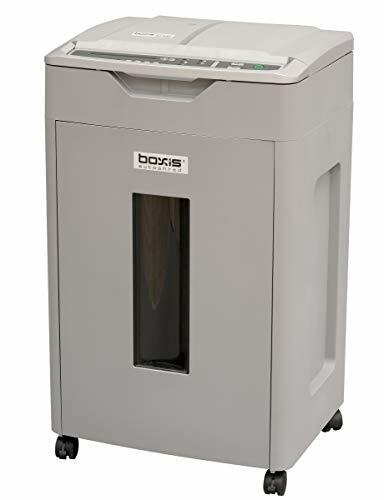 Cross-cut paper shredder with max 6 sheets (A4 size 75g/m ) shredding capacity; Shreds paper into tiny particles measuring 5/32 x 1-25/32 inches (4x45mm), high-security grade P4, destroys staples as well. 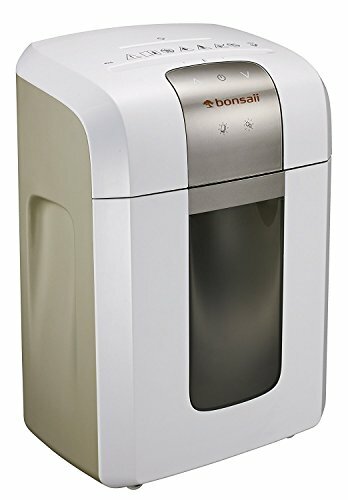 3.5 gallons wastebasket capacity for less frequent emptying with basket window to see when it is full. Auto start and manual reverse to clear paper jams; Thermal protection system to protect the motor from overheating. Convenient handle design for simple waste disposal. 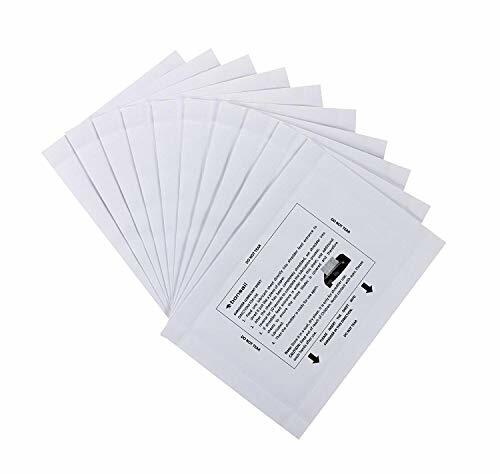 Continuous running time up to 120 minutes without stopping for mass documents destroying;Quiet operation :58 dB low noise level will give you a quiet and smooth shredding exprience. 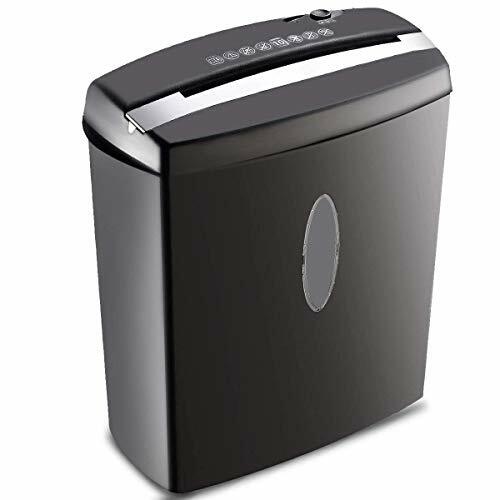 High-security and heavy duty cross-cut paper shredder with 14 sheets (A4 size 75g/m ²) shredding capacity; Shreds paper into tiny particles measuring 5/32 by 1-19/50 inches (4mm x 35mm),Security level P-4. 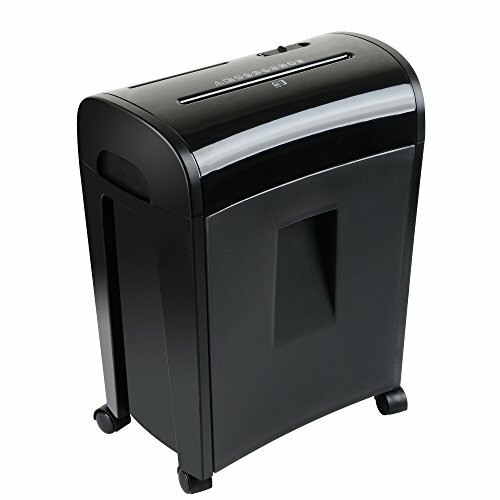 Shreds paper, credit card, CD/DVD, clips, staples; Shredding speed reaches 7.2 feet per minute;Backed by 3 years warranty. 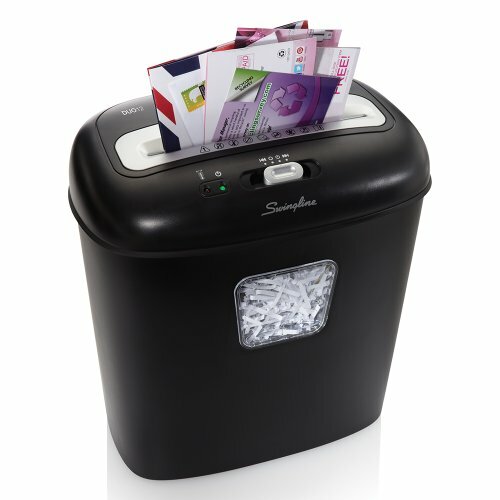 Jam protection system with auto start and auto reverse to protect you from the frustration of paper jams, overheating and overloading protection technology to keep sustainable using the shredder and prolong its lifetime. 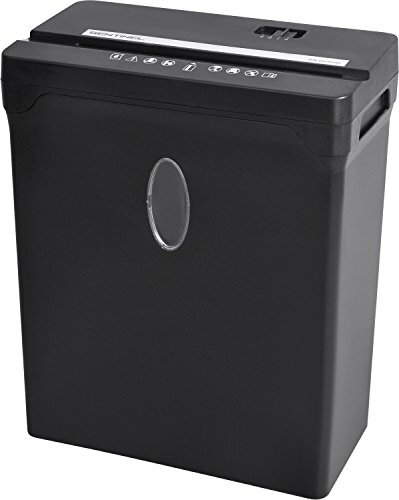 6 gallons large pull-out wastebasket capacity for easy and less frequent emptying, a 0.37 gallons separate small bin for CD/DVD and credit card pieces collection, and the transparent window makes it easy to see when wastebasket is full. 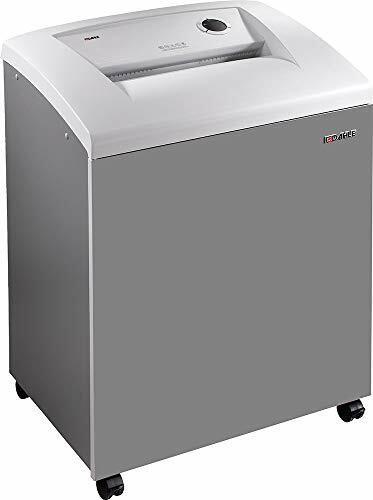 Work great with all shredders.Sheet Size: 8 1/2" x 6"
Continuous running time up to 30 minutes without stopping for mass documents ,destroying 3500 sheets completely with patented cooling system. 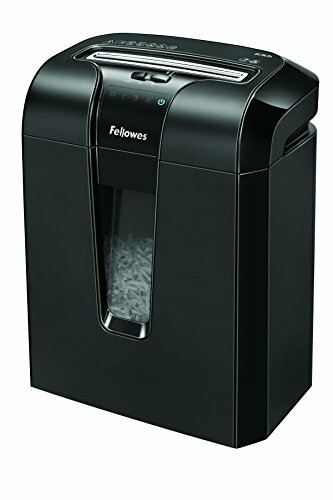 Cross-cut paper shredder with 14 sheets (A4 size 75g/m ²) shredding capacity; Shreds paper into tiny particles measuring 1/4 x 1-14/25 inches. 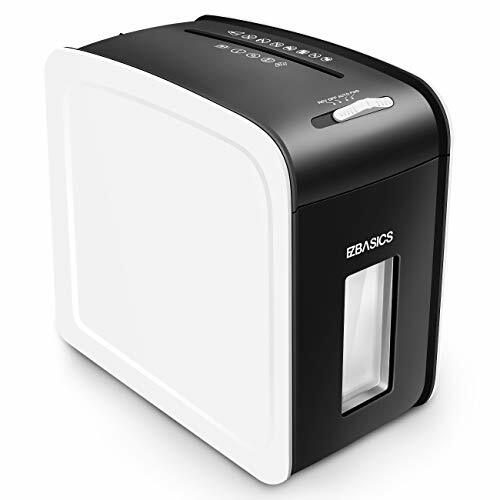 Jam protection system with auto start and auto reverse to protect you from the frustration of paper jams. 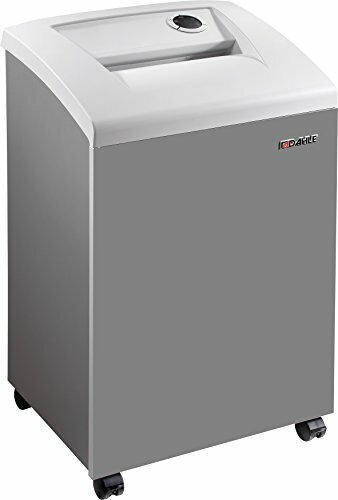 4.5 Gallons pull-out wastebasket capacity for less frequent and easy emptying, and the transparent window makes it easy to see when it is full. 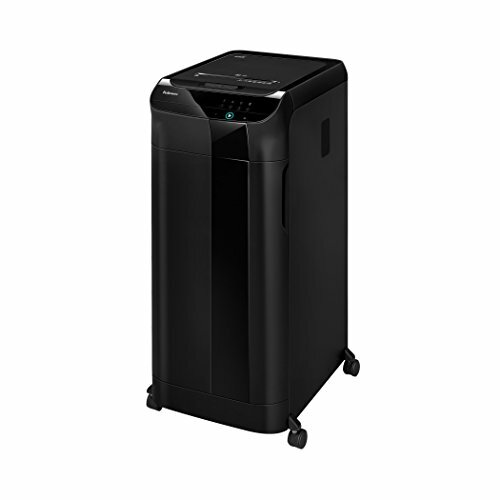 Continuous running time up to 240 minutes without stopping for mass documents destroying;Quiet operation :58 dB low noise level will give you a quiet and smooth shredding exprience. 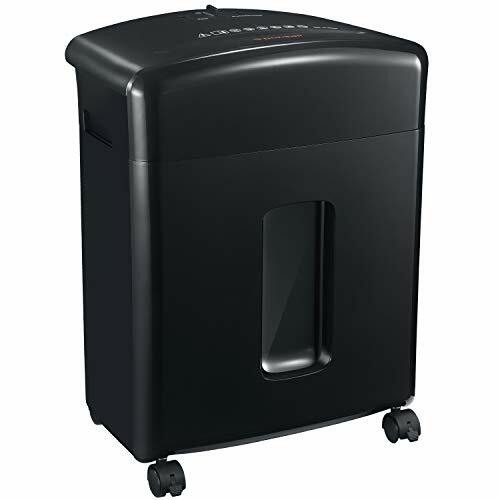 High-security and heavy duty cross-cut paper shredder with 18 sheets (A4 size 75g/m ²) shredding capacity; Shreds paper into 5/32 by 1-19/50 inches (4mm x 35mm),Security level P-4. 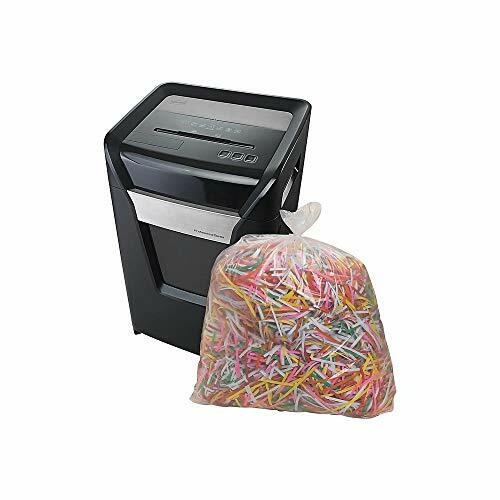 Shreds paper, credit card, CD/DVD, clips, staples, ultra-low noise to 58dB;Shredding speed reaches 5.9 feet per minute. 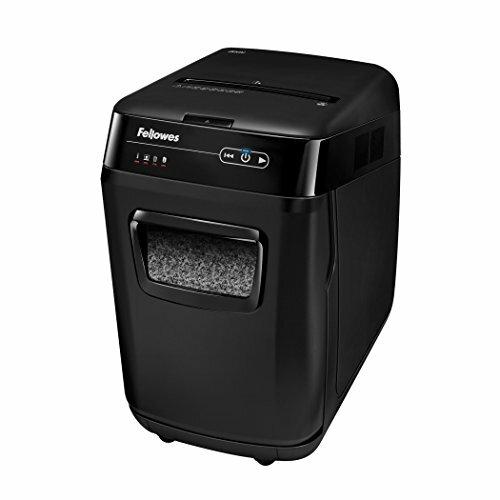 Jam protection system with auto start and auto reverse to protect you from the frustration of paper jams, overheating and overloading protection technology to keep sustainable using the shredder and prolong its lifetime . Continuous running time up to 240 minutes without stopping for mass documents destroying. 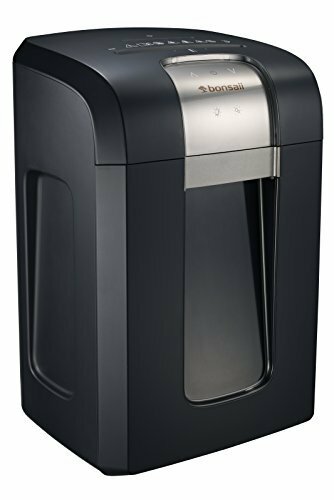 Bonsaii DocShred C156-D 12-Sheet Cross-Cut Paper/CD/Credit Card Shredder with 5. PRICE REDUCED ! ! ! Double the life-span of competitive models. MASSIVE 1 horse-power motor for the toughest jobs. 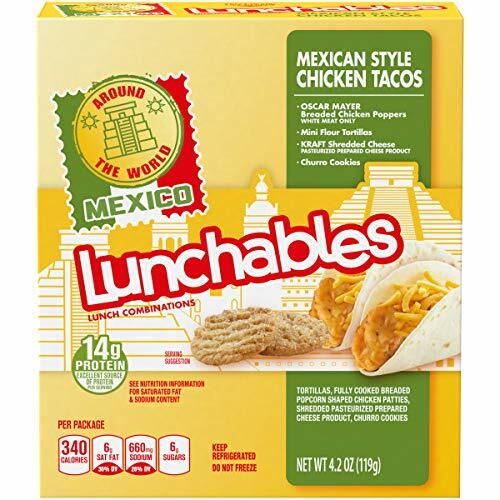 Half the price of anything in its class, and TWICE the life-span. 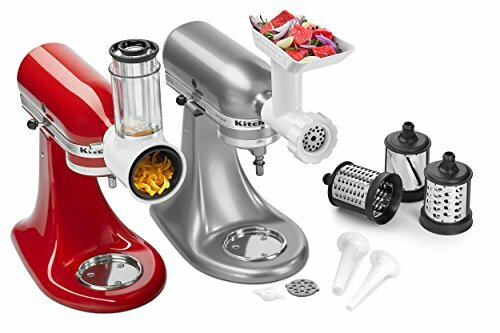 Attaches to power hub of your stand mixer and uses the power of the motor to run the attachment. Fits all household KitchenAid stand mixers. Food grinder with fine plate for meats & coarse plate for firm vegetables & cheeses. Sausage stuffer parts for the food grinder attachment to make sausages from scratch (requires KSMGSSA fga, included). PRICE REDUCED ! ! ! 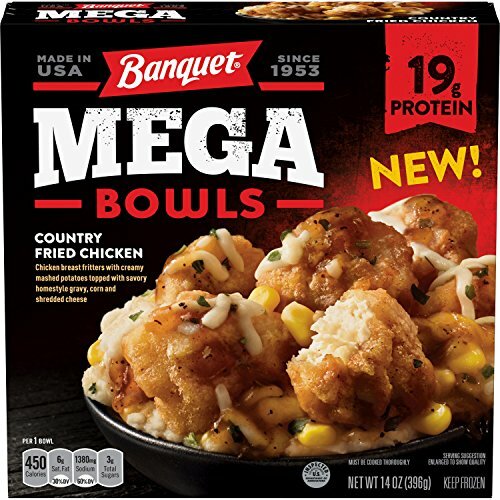 . . . . . . . . . . . . .BIG 8-Gallon Bin, less dumping. MASSIVE 1 horse-power motor is most powerful in its class, quiet operation. 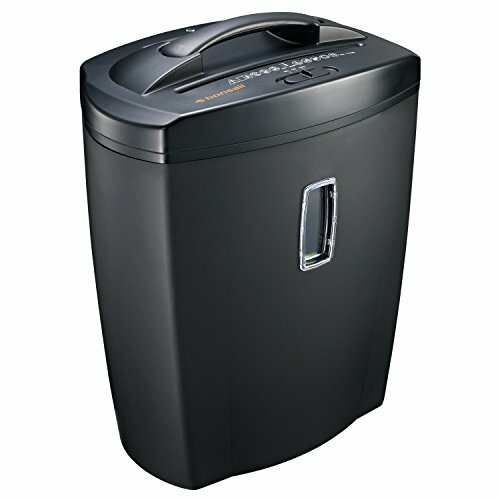 Easily shreds CD's, Credit Cards, Paper Clips and more. 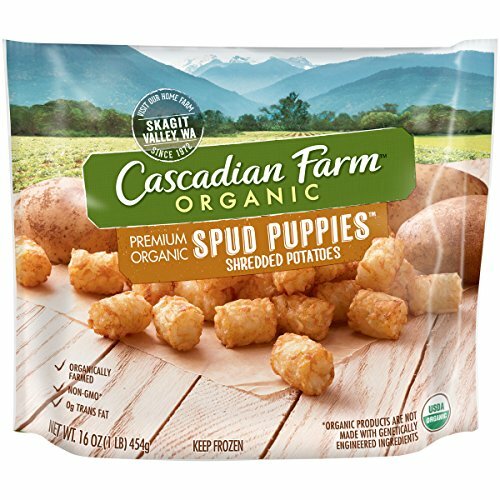 DOUBLE the LIFE-SPAN versus competition due to patented cutting system, provides years of extra operation. Ultra low noise design: 58 dB Noise Level is equivalent to the sound of a two-person conversation. Maintain your quiet office/indoor environment! 【Lubricant is not needed】Exclusive Cutter Design: Perfect for shredding all your confidential documents, Credit Cards, Clips and Staples. 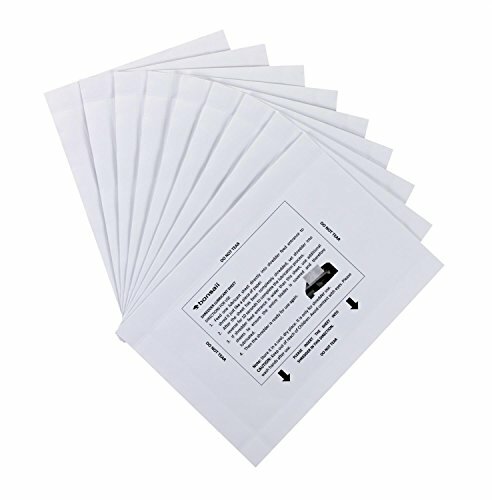 Lubricant is not needed and reduces paper jams. The cutter's life expectancy is an industry leading 7 years. Compact & Stylish: Fits anywhere and amplifies your décor. 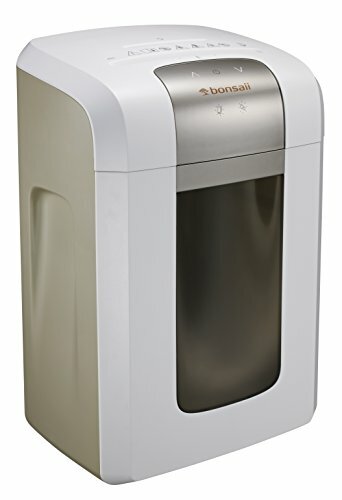 The transparent window makes it easy to see when the wastebasket is full. 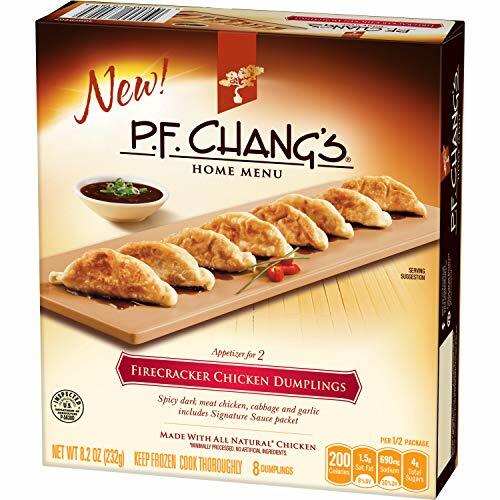 Pull-out design provides an easy tray for dumping. 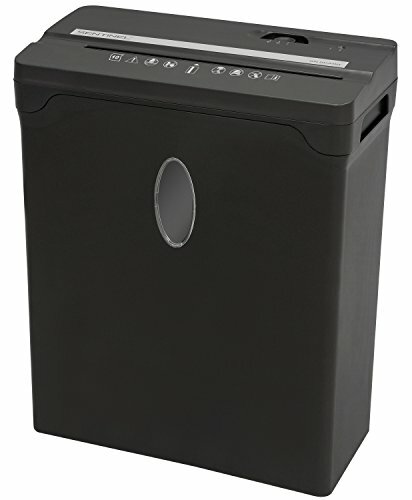 Higher Security Level: Cross-cut shredder with 5 sheets capacity; Destroys credit cards (one at a time); Shreds paper measures 3/19"x 1-3/16", meeting security Level P4 standards. 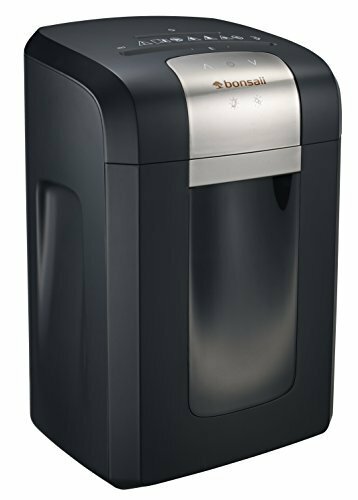 Functions & Warranty: Auto start and manual reverse to clear paper jams; Automatically stops shredding when it overheats, overloads or the wastebasket is removed. 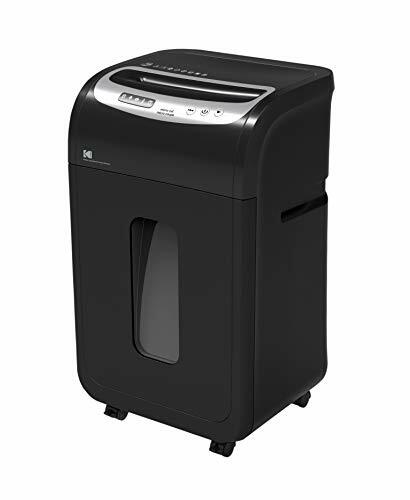 EZBASICS paper shredder comes with a 2 year limited warranty. 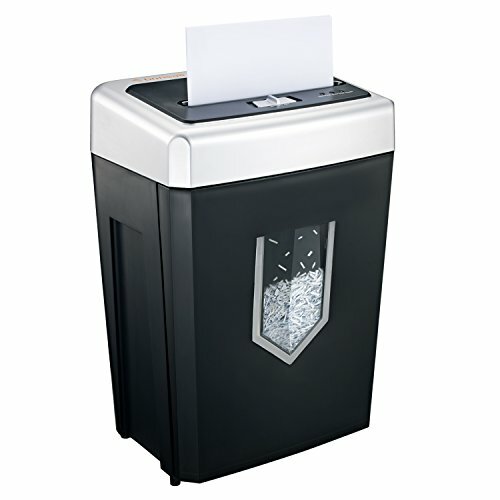 Patented AccuFeed System automatically shreds stacks of paper including documents with staples. Simply load the drawer, press start, and walk away. 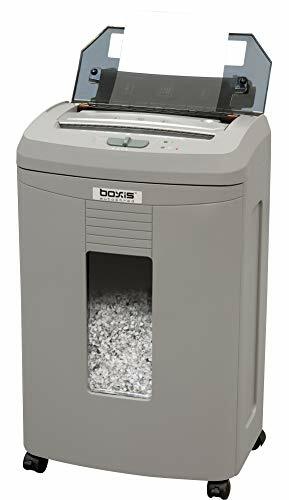 The auto feed tray of the Boxis autoshred AF60 can take up to 60 sheets at a time and will automatically start destroying your documents at speeds up to 11 feet per minute. Automatic forward and Reverse Modes reduce the risk of jams. Din level P-4 High security. There is also a manual feed intake which will take up to 6 sheets for your convenience. 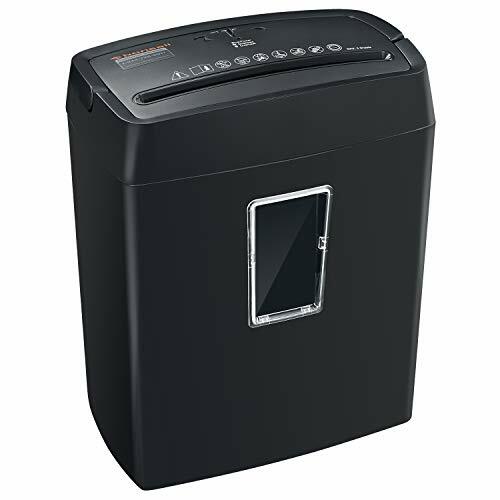 The motor has a 20-minute continuous run time to finish large shredding tasks. 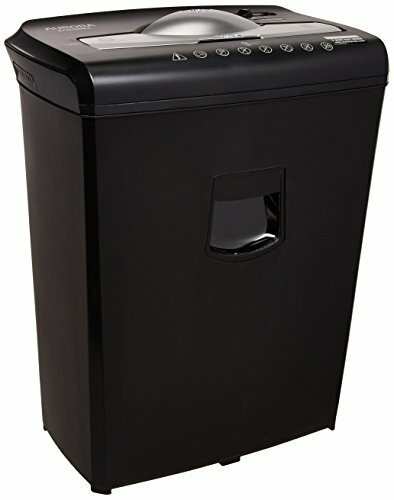 A 3.6 gallon capacity pull out waste bin with a window to see when container is full. Other features include auto start/stop, manual Reverse function, open door, overload & overheat indicator, ultra-quiet operation of 65Db, and casters make it easy to move. 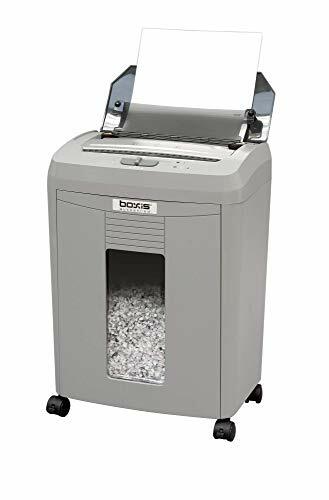 The auto feed tray of the Boxis autoshred AF110 can take up to 110 sheets at a time and will automatically start destroying your documents a page at a time at speeds up to 11 feet per minute. 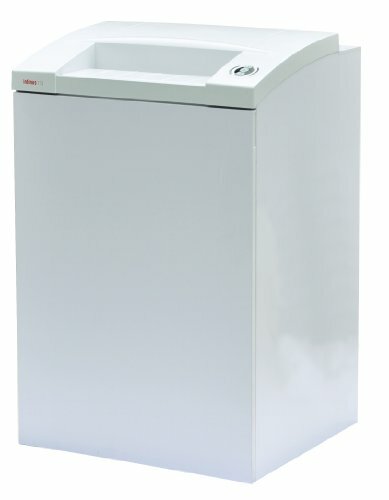 There is also a manual feed intake which will take up to 10 sheets for your convenience. 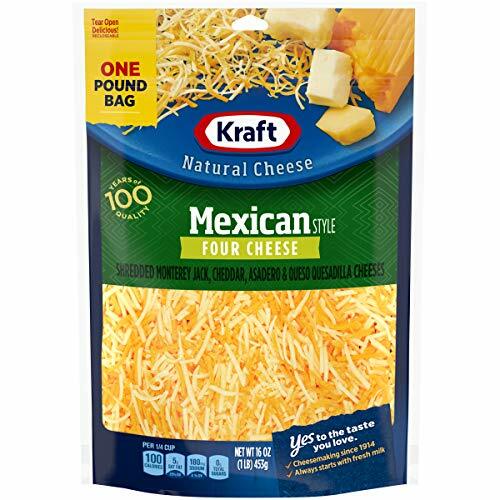 The motor has a 20-minute continuous run time to finish large shredding tasks. 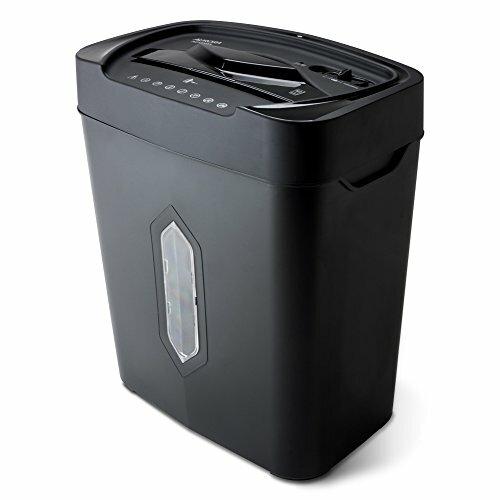 A large 6.0 gallon capacity pull out waste bin with a window to see when container is full.